Depending on your view point Death Sentence is a decent and decidedly bloody revenge flick or a series of what not to do’s. 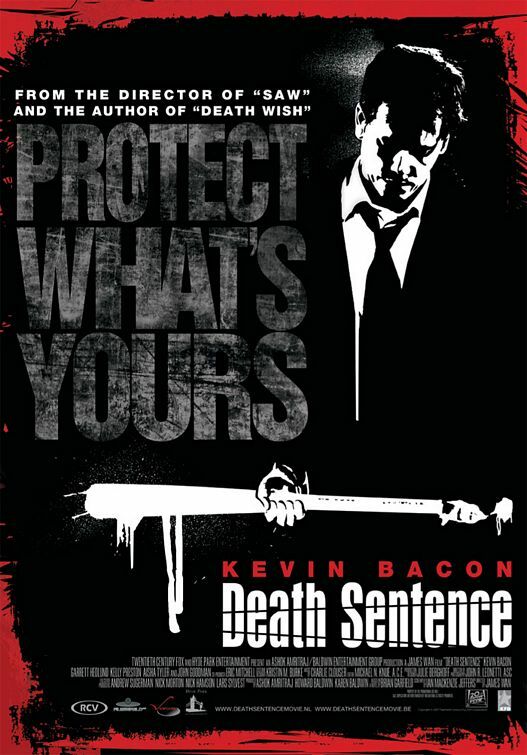 The revenge flick line goes like this: When his son is a victim of a gang initiation killing Nick (Kevin Bacon) decides not to let the case run through the justice system but to handle his vengeance all personal like. This decision has ramifications for all. Far, far, far fetched ramifications. Everyone knows who did it, but no-one seems to know where they are or how to stop them, including the cops. So Nick ignores all advice and common sense and tools up to get ‘er done himself. Now while the saying might go ‘If you want something right do it yourself’, the reality is somewhat different, especially if you are ill equipped to actually do the job in the first place. Don’t sweat the fact that a seedy kid in a hoody shows up at your office spouting loud unveiled death threats. Your colleagues will surely listen and report it to the police? Final Rating – 6.5 / 10. Ultimately this is a film that requires a deliberate ignorance of logic to permit enjoyment. If you can do that it’s not terrible. If you can’t it becomes a warning film for idiots, a la Edgar Wright’s great fake trailer ‘Don’t!’ from the Grindhouse films.